Bruno and Lauren breezing down the track. We have had Bruno for almost 18 months now. Time flies. A year ago we were deep in his care wrapping, treating and working on his surgically altered hoof, day after day. And each day we would marvel at Bruno’s great beauty and strength. He is hands down the most amazing looking horse I have ever owned. I have had some great ones over the years, including a mare by AQHA super horse, Rugged Lark. She was indeed a beauty, but not as startling beautiful as Bru. From the beginning, we dreamed great things for this horse. 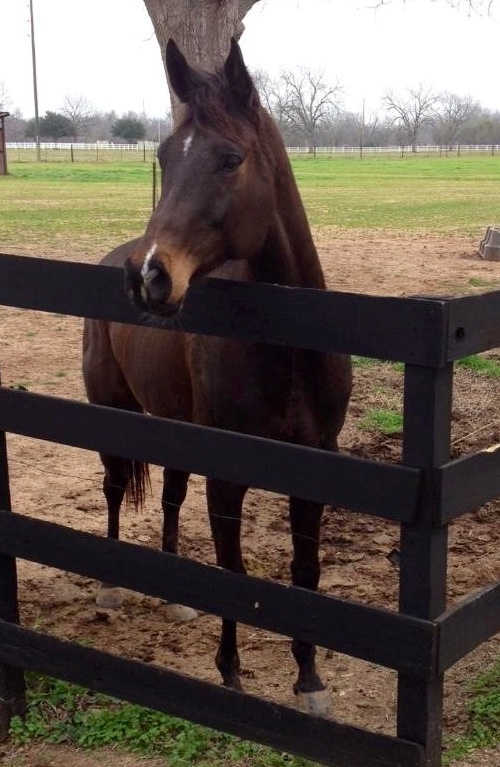 I am part of the OTTB Connect group on Facebook and while I can’t speak for everyone, it is doubtful to me that any of us obtained our OTTB without some thought of what our new thoroughbred could do. And many of them progress on to great, new things. But some become more a cherished pet than a show horse. That’s okay, too. My friend Caroline has rescue horse Joey whom she got up to a safe weight, fixed his hoof issues and turned his dull coat into one that gleams. She tried to find him a new spot where he would work out for another rider but Joey ended up shuttled around Texas until fate intervened, someone happened to read my blog and Joey came home to Caroline once again. But in way worse shape than he started. We have had HUGE dreams for Bruno. He has the size, the breeding, the look and the conformation to make a top show horse. Joey is a classic looking thoroughbred as well, tall, fast and smart. Both of these boys could have great futures in the eventing or show ring. Handsome Joey, hanging out waiting for something to do. Caroline and Lauren are excellent riders who can handle the antics and excitement provided by two, young, race bred horses. Here’s the problem. Both ladies have show horses needing regular, consistent riding. 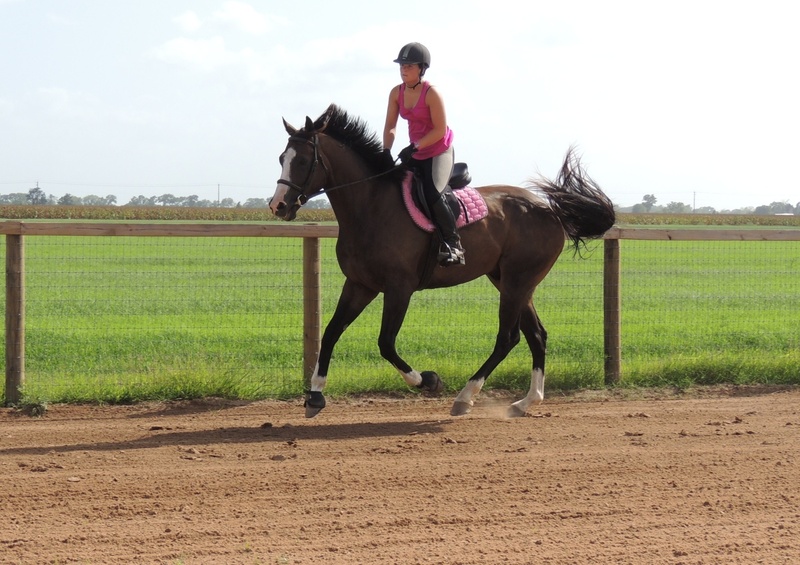 Both of their other horses are further along and currently show great promise in the ring. It is a hard dilemma. Lauren and Caroline have both been intermittently sidelined with back problems. Both ladies have school or jobs which take up their time. It is sad but true that both of these OTTBs are pretty much on the back burner. Neither Caroline or I want to sell these horses. Too much love and care has gone into them. But it is sad to see them lose yet another year as we cannot find the time or resources to get either of them in a regular training program. I welcome ideas on what to do with the boys to keep their training going, start showing them and continue to develop them as sport horses after the track. This entry was posted in A Bruno Story, A Joey Story, Horses, The horses of Six Meadow Farm by Exechorseluver. Bookmark the permalink. Maybe there is a good rider out there looking for a ride that can’t afford to keep a horse, Have you thought about talking to your contacts to see who they might know? Ideally you would keep the horse at your place or the rider could pay to keep it at Dev’s so it is always under your watch or someone you trusts. Maybe Dev or Dr. Criner would know of someone or your other horse show contacts? Good luck, it is a hard problem to have and I certainly understand you not wanting to send him down the road, you just never know where circumstances will leave him. Good luck.